Tom Zamagni has coached at Whitman-Hanson for 24 years. In Tom Zamagni’s office, there’s little space left empty, and he wouldn’t want it any other way. Every banner hanging signifies pride, every scrapbook sitting on the table causes a chuckle, every picture adorning the wall recalls a memory. But they all signify relationships. 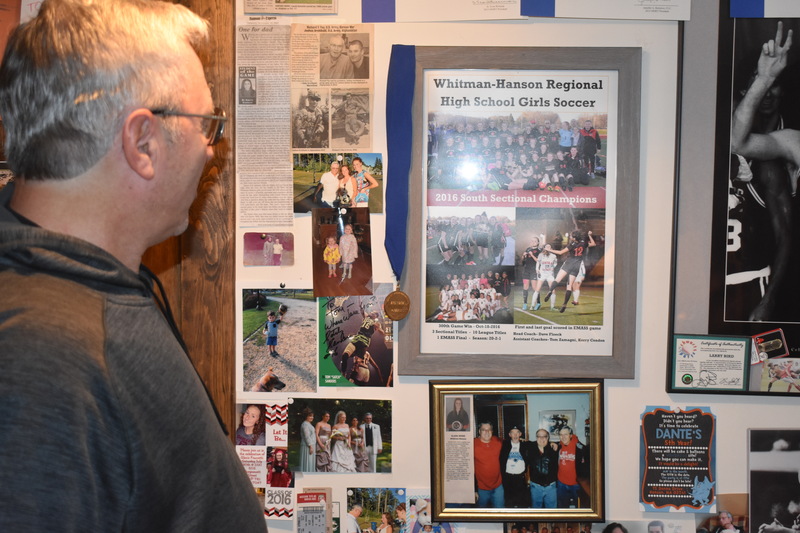 It’s a collection — that’s inching into his sitting room — Zamagni has been piecing together for the past 24 years he’s been prowling the Whitman-Hanson Regional High girls’ soccer team’s sideline. It’s journey that began from an inside tip. One of his favorite photos lies in a scrapbook. It’s of him and Dave Floeck walking down to Dennis M. O’Brien Field for practice. It’s a friendship that formed nearly 22 years ago after Zamagni was ready to quit coaching after two seasons due to a heavy workload off the field in the finance industry. Floeck found Zamagni’s multi-sport knowledge appealing. This stemmed from his time playing shortstop and coaching St. Joseph’s The Worker Catholic Church’s softball team, as well as playing baseball. Under Floeck, Zamagni initially served as the goalkeeper coach. Kerry Flood, a 2010 W-H alum, spent four seasons being coached by Zamagni in net. “He had a significant impact on my development as a goalkeeper, since I had never been committed to the position prior to high school,” Flood said. Flood, who can be seen in numerous pictures around her former coach’s office, said Zamagni provided a wealth of knowledge and source of inspiration on the sideline during her playing career. However, his most impactful moment to her came in 2009 prior to a state semifinals game against Acton-Boxboro. It’s simple messages like that Zamagni hopes resonate with his players. Flood rejoined the program in 2015 and eventually took over training the goalkeepers, while Zamagni shifted to drawing up game plans for the defense, but he still keeps his eyes on the whole field. Sometimes it’s minor – like a defensive adjustment. Over Zamagni’s 22 years as Floeck’s assistant, the Panthers haven’t had a losing season since 1999, have won numerous Patriot League titles and made a trip to the state finals. The success is gratifying, but the bonds he has created along the way are even more rewarding. He’ll even miss work to watch a W-H girls’ soccer alum, such as this past season when Marina Kelly, class of 2014, returned to Dennis M. O’Brien Field in a different uniform – as Scituate’s JV soccer coach. “I had to cancel a meeting so I could get up there and see it,” Zamagni said. In his spare time, Zamagni, if not at the youth soccer field in Hanson watching his grandchildren play, is keeping tabs with alumni — whether it’s a trip to Rhode Island to watch them play, a simple text or over breakfast. Flood said it’s that type of dedication to the program’s alumni that makes Zamagni an irreplaceable presence on the sideline. Past team captain and freshman at Manhattan College Eve Montgomery said Zamagni’s selflessness stood out to her. Former All-American Lauren Bonavita, currently playing at UMass Amherst, said Zamagni was more than just a coach to her. Zamagni said his main motivation to come back every autumn is because of the bonds he creates. And walking past countless memories from the past two-plus decades in office on a daily basis plays a major role in that mindset.